Los Angeles & Barcelona (June 13, 2017) – RealD Inc., the world’s largest 3D cinema platform and visual technology company, and POWSTER, a leading creative studio helping to connect movie studios and moviegoers, have teamed up to provide a virtual reality promotion for this year’s CineEurope, taking place in Barcelona, Spain from June 19-22. POWSTER, located in London and Los Angeles, is a VISTA Group International company (NZX & ASX: VGL). 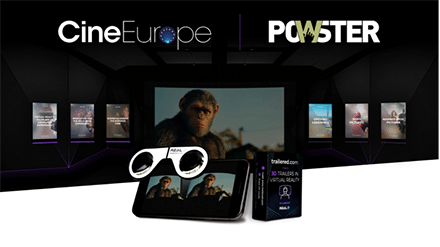 Upon registration, each CineEurope delegate will receive a packet that includes the world’s first RealD-designed VR glasses to be used with POWSTER’s new mobile phone app trailered.com, which allows attendees to experience the CineEurope conference in a virtual reality cinema. The CineEurope experience begins with 3D clips of invitations to official movie studio slate presentations, panel sessions and other important conference events. Attendees also can access an advanced experience of the regular trailered.com website, which allows the user to watch trailers for movies at nearby cinemas in 3D, making the decision to attend a film quick and easy. Vista Group International (Vista Group) is a public company, listed on both the New Zealand and Australian stock exchanges (NZX & ASX: VGL). Vista Group provides cinema management, film distribution and customer analytics software to companies across the global film industry. Cinema management software is provided by Vista Entertainment Solutions, the core business of the Group. Movio (data analytics), Veezi (cloud-based Seas software for the Independent Circuit Market), MACCS International (film distribution software), Numero (box office reporting software for film distributors and cinemas), Cinema Intelligence by Share Dimension (business intelligence solutions), and POWSTER (creative studio and marketing platform for movie studios) provide products that leverage the success of this platform into other parts of the film industry; from production and distribution, to cinema exhibition through to the moviegoer experience. Vista Group has over 400 staff across nine offices in New Zealand (Auckland headquarters), Sydney, Los Angeles, Dallas, London, the Netherlands, Romania and Shanghai.